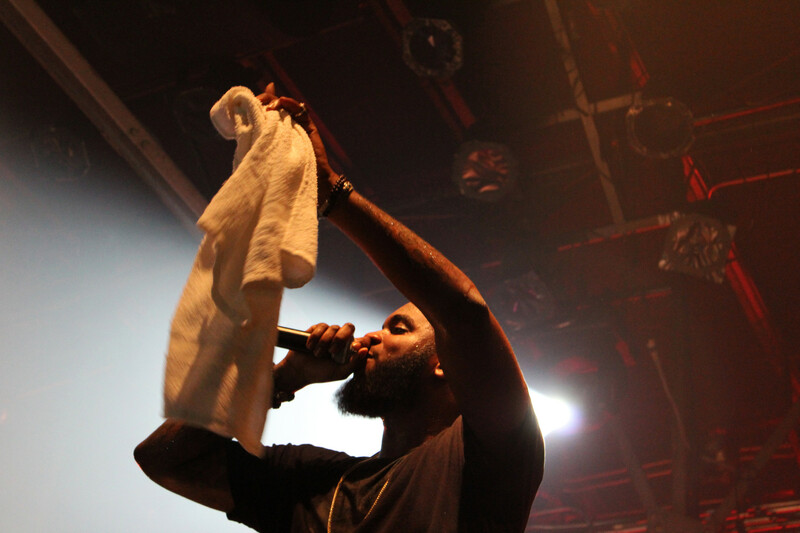 With two lines wrapped around the venue an hour before show time, it was clear that Big K.R.I.T. was going to give our fair city a night it wouldn’t soon forget. The rapper’s 39-city Kritically Acclaimed tour stopped in Houston Nov. 24 at Warehouse Live. Anticipating a great show, some fans began gathering on St. Emanuel St. around 4 pm. When event staff opened doors at 8:15, the buzzing energy surrounding the place only intensified. The omnipresent DJ Mr. Rogers was on hand to entertain the crowd before the first opening act took the stage. As usual, he fielded requests on his Twitter timeline. He played a variety of tracks to keep fans hyped, but his Houston hip-hop medley was the best part of his set. Rogers introduced Houston-area rapper EDF, who performed a handful of songs for the crowd to vibe out to. Soon after, rapper James Curtis took the stage for five songs and made his audience feel all of the feels with “Bad Decisions.” In an effort to keep the excitement going, Curtis engaged the crowd in “city wars” and brought out posters with the names of three Texas cities—Austin, Dallas and Houston—and painted on them. The two former cities, of course, received absolutely no love. There was a short lull in entertainment while the stage managers began setting up for the headliner. At 11:20 pm, a restless crowd started chanting K.R.I.T’s name. Ten minutes later, K.R.I.T. jumped on stage—backed by a drummer, guitarist and DJ Dibiase (who spins from a booth made to look like the front of a classic Cadillac). The rapper performed songs from his second studio album Cadillactica like “Third Eye” and revisited hit track “Country Sh-t.” K.R.I.T. surprised fans with performances from legends Lil Keke, Slim Thug and Bun B.
BJ returned to the stage for a duet of “It’s Better This Way.” Toward the end, K.R.I.T. turned the song over to the crowd who needed no help reciting the lyrics. Nearly an hour after taking the stage, K.R.I.T. remarks that “it’s not time because we’re still partying.” The crowd stayed hyped for one last song and K.R.I.T. jumped down from the stage to shake hands and take pictures with fans. Of course, that wasn’t quite the end—K.R.I.T. came back to the stage to perform “Mt. Olympus” and ended his show with a joint chant of his name between himself and his supporters. Having never been to a Big K.R.I.T. show before, I’m glad to say that I was pleasantly surprised. The amount of love shown to Houston, our rappers and southern hip-hop was overwhelming. K.R.I.T. is a dynamic performer who can truly captivate a crowd—and even though it probably doesn’t need to be said, his music is great too. There are two Texas dates left, so if you’re interested and don’t mind traveling, pick up a ticket. Don’t forget to follow these artists on social media.